If you are traveling by yourself or just a couple, please let us know if you would like us to try to combine you in another flight to lower your cost. You will want to layer your clothing so you can add or take off layers. Make sure your camera/video camera is charged and has lots of memory. This will help you get all those great pictures for holiday cards and photo albums. We suggest you bring sunglasses. Denali (Mt. McKinley) is one of the most spectacular alpine areas in the world. 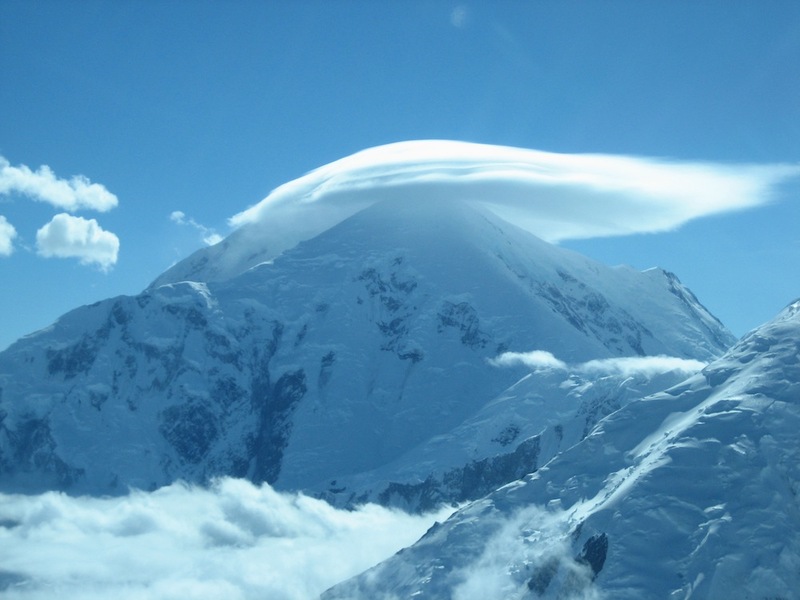 The view is great from the road look-out, but you have to fly into Denali to see the incredible alpine area surrounding the summit. 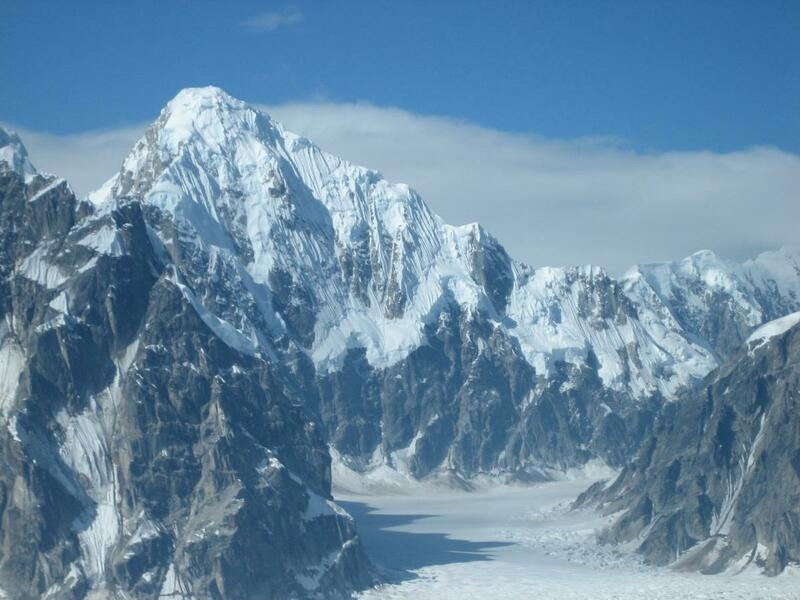 Our Mt.McKinley experience flight tour lets you see it all! 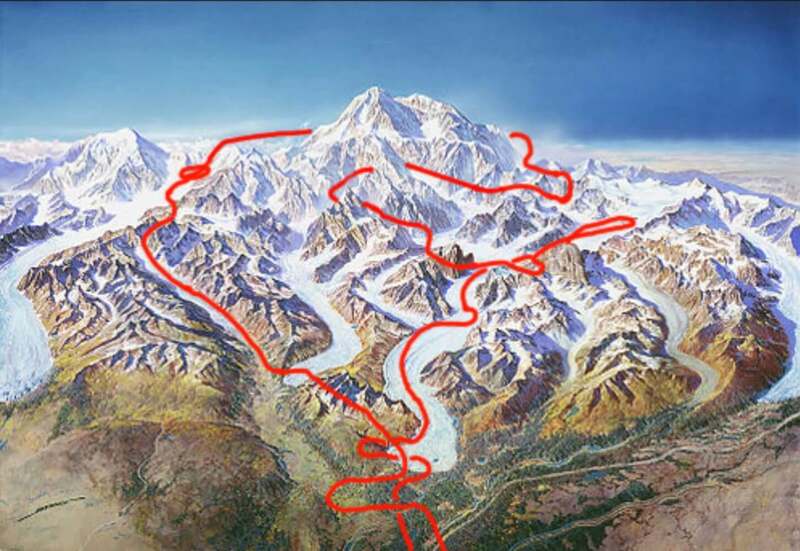 You will fly all the way around Denali. This flight will leave Talkeetna and start climbing for Base Camp. 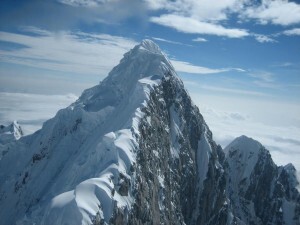 On the way, you will fly by the Tokosha Mountains, the “Toe of the Tok” and Little Switzerland. Your optic nerves shift into high gear after you fly through One Shot Pass and into an Alpine world where everything is so huge that it is impossible to grasp the scale and size. Distances are warped! 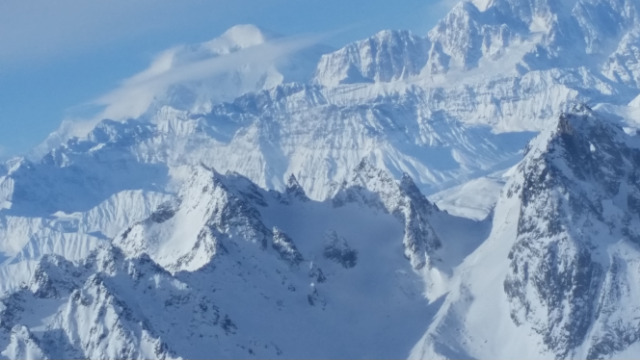 We’ll fly over Base Camp which is nestled down in the South East Fork of the Kahiltna Glacier between the Summits of Foraker and Denali. During climbing season (peak May and June) you will be looking at a continuous stream of climbers on there long effort to climb Denali. 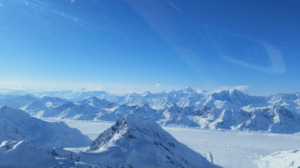 Continuing around Denali, we fly over Kahiltna Pass to the North Side. 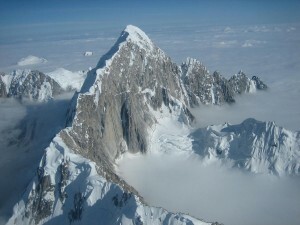 The Wickersham Wall, the tallest continuous vertical rise in the world, dominates here. We’ll fly up the Muldrow glacier for the Traleika Col to cross back over to the South Side. The incredible terrain never lets up as we descend into the Don Sheldon Amphitheater. 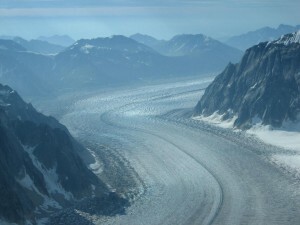 We will fly out of this alpine area through the Ruth Gorge, following the glacier down to the surprise Ruth Geyser. The largest mountain in North America, Denali has a larger bulk and rise than Mount Everest. Although the summit of Everest is higher at 29,029 feet (8,848 m), it sits on the Tibetan Plateau at about 17,000 feet (5,200 m), giving it a real vertical rise of a little more than 12,000 feet (3,700 m). 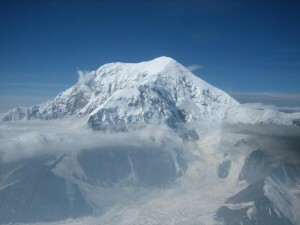 The base of Denali is roughly 2,000 feet (610 m), giving it an actual rise of 18,000 feet (5,500 m).